Every day, you take thousands of breaths without even thinking about it. The process of breathing in and out allows fresh oxygen to pass to the blood, as carbon dioxide is removed from the body. Deep breathing, however, is a mindful practice that provides numerous health benefits beyond the standard respiration required to live. 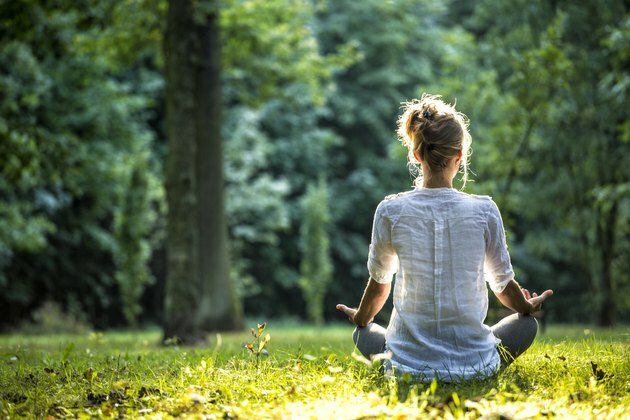 With practice, you can train yourself in breathing techniques that reduce stress and improve certain bodily processes. The lungs have a big job, sending oxygen into the bloodstream to be delivered to every cell in the body. As you inhale, the diaphragm contracts to take in oxygen. However, if you’re not breathing deeply, the lungs eventually may lose some of their elasticity, causing air buildup in the lungs. This air buildup reduces the space in which the diaphragm can contract. The end result can be shallow breathing patterns that hinder the lungs’ ability both to take in oxygen and deliver it to the blood. You also may start resorting to using the neck, back and chest muscles to assist with breathing, leading to muscle fatigue and soreness. In contrast, deep breaths increase the lungs' capacity to push out excess air and function optimally. With regular deep breathing, you can expand your diaphragm muscle and the air pockets within your lungs. The lungs are then able to clear out toxins and deliver oxygen to the blood at a greater rate. With this oxygen boost, your body gets the oxygen it needs for exercise, proper cell function and a range of other bodily processes. Deep breathing offers numerous health benefits, from stress reduction to a slower heartbeat and reduced blood pressure. It also promotes core muscle stability and helps you better tolerate intense exercise. It may even help lessen the symptoms of post-traumatic stress disorder. Additionally, deep breathing is particularly helpful for managing stress. Stressful thoughts may cause the “fight or flight” response, also known as the stress response, as a reaction to a perceived danger. With the stress response, the body’s sympathetic nervous system alerts nerve pathways to trigger the adrenal glands, which then release adrenaline into the bloodstream. This adrenaline burst increases your blood pressure and pulse rate and may cause you to breathe short, shallow breaths from your chest. The stress response is helpful in times of real danger — say, when you need to jump out of the way of a speeding bus. However, problems occur when your body is regularly on “high alert” and pumping out adrenaline even in response to non-life-threatening occurrences. That is, your body doesn’t know the difference between real and perceived threats. So if you’re experiencing money problems, for example, your body may invoke the same stress response as it would if you were standing in front of a speeding train. If your body tends to default to fight-or-flight mode, deep breathing can give you instant relief. By breathing deeply from your diaphragm, you ignite the body’s parasympathetic nervous system. This system reverses the stress response by slowing the heart rate, lowering blood pressure and calming the mind. With deep breaths, you can activate the body’s relaxation response, a state of profound calm. Note one caveat for those who have been diagnosed with mental health conditions such as generalized anxiety disorder: Deep breathing will not always help those with mental health concerns — in fact, it could have the opposite effect if you’re not getting the results you desire. In these cases, cognitive behavioral therapy or hypnotherapy may be more effective in treating the disorder. Read more: Why Does Deep Breathing Calm You Down? When you feel stressed, deep breathing for a few minutes can give you instant relief. There are many different techniques you can try to breathe deeply from your abdomen instead of from your chest. Experiment with different exercises to see which ones give you the greatest feelings of calm. For diaphragmatic or belly breathing, sit down or lie down flat on your back. Place one hand on your belly and one hand on your chest. Breathe in slowly through your nose and let your belly expand, ensuring your chest does not move. Breathe out slowly through slightly parted lips, as though you are whistling. Use your hand to push all of the air out of your belly, and repeat the exercise three or more times. The 4-7-8 breathing technique is similar to belly breathing. Simply perform the exercise above in the same manner, but add in counting. As you inhale, count to four, and then hold your breath for a count of seven. Exhale to a count of eight, again using your hand to push all of the air out of your stomach. Repeat as desired. Still another technique is Ujjayi breath, a yogic term for deep breathing. This exercise is commonly used in yoga classes to generate internal body heat and to assist in quieting mind chatter. For Ujjayi, start in a relaxed, cross-legged position and breathe in through your nose slowly and smoothly — as though you are sipping air through a straw. Slightly constrict the opening of the throat so that as you exhale, there is some resistance as you push the air out. Ujjayi breath should have an audible, oceanic sound. Note that you can combine Ujjayi breath with the other breathing techniques described. It’s important to practice deep breathing techniques in an active state so your body can readily experience the benefits. You cannot properly and consciously practice deep breathing while asleep, for example, or while slumped over on the sofa watching television. Be sure to sit up tall or lie down flat so your diaphragm is not constricted and unable to inhale and exhale fully. Even just a few minutes of deep breathing daily can help you to reduce stress, improve lung function and experience other health benefits. Start with about five minutes a day and work your way up to 20 or 30 minutes for optimal results. With practice, your body may more readily turn to deep breathing rather than rush to the stress response. Healthline: What Is Diaphragmatic Breathing?